With the holidays fast-approaching, the deadline for ordering gifts from the Baltics to arrive in time for the holidays is just around the corner. While a few large cities have Christmas markets at their local Latvian/Lithuanian/Estonian centers, many of us don’t have the luxury of a local tirdziņš, or we prefer to do our holiday shopping online. Today on Day three of 24 Days of a Baltic Christmas I’m pleased to have BalticShop joining me with the 2015 Baltic gift guide. 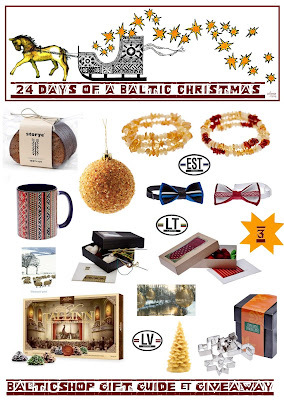 As one of the premier importers of Baltic goods into the US, Balticshop is your online source for fine Baltic gifts! Their mission is to offer you a store with goods from the Baltic countries that are hard to find locally but reflect the region's culture, and this year’s catalogue is full of Christmas cards, calendars, cranberries, candy and much more to check off every name on your list. 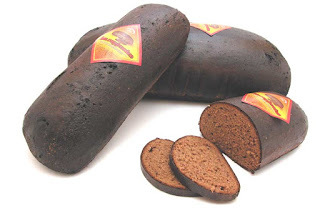 One of the hardest things to find in the US is a heavy, dark bread similar to the one your grandmother used to make… From rye bread to sourdough, BalticShop has you covered: traditional breads imported straight from Latvia made without preservatives or additives. Available in 2kg loaves as well as in 1lb packages. There's a lovely jewelry section also. The Light Amber and Multi-Color Amber Memory Wire Wrap Bracelets are one size fits all and made in Rīga, Latvia, from genuine Baltic amber. 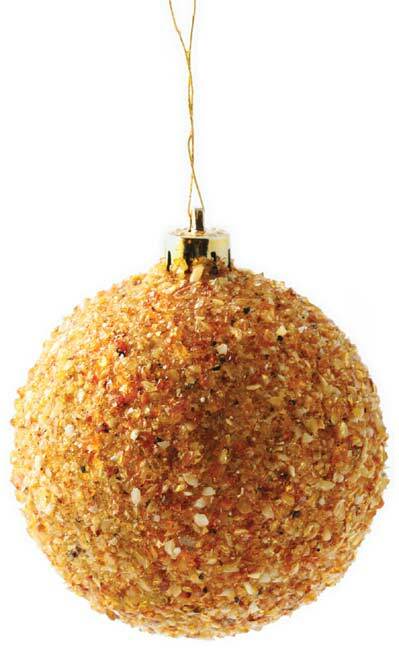 Or if you would prefer the amber in your Christmas tree rather than on your wrist, check out these amber ornaments, which come in three different sizes (the large is pictured, see here for small and here for medium). With bowties back in style you’ll be the hit of the party with these patriotic flag ties. Made of natural linen, the Estonian flag is handmade in Estonia and the Latvian sarkan balt sarkans with traditional designs is handmade in Latvia. 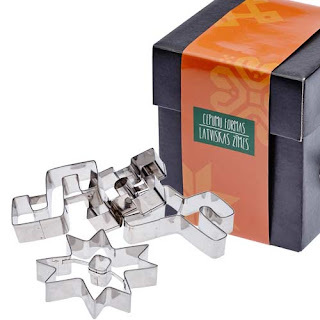 We brought back a few sets of these cookie cutters from Latvia last year for presents because they weren’t yet available online; it's not surprising that they are one of this year's bestsellers. The set of 4 (Zalktis, Jumis, Auseklis, Krustu krusts) also includes cookie recipes and written explanations of the symbols. Made of stainless steel, they are manufactured in Rīga. The Latvian folk costume motif coffee mugs and coasters come in a variety of shapes, sizes and designs. 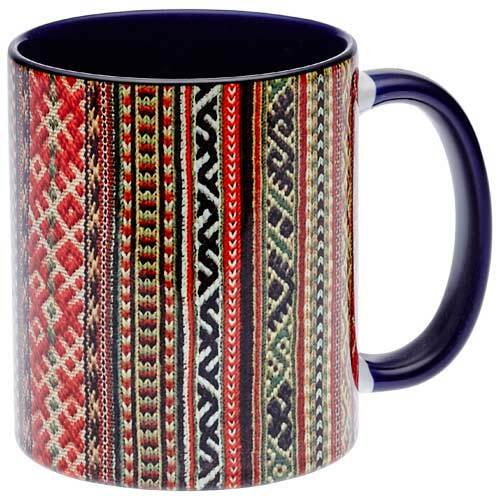 My favorite is the Latvian vertical weave mug, although the belt motif mug is a close second, as it reminds me of my bērnības tautas tērps. For those with a sweet tooth BalticShop features Estonian Kalev chocolate. 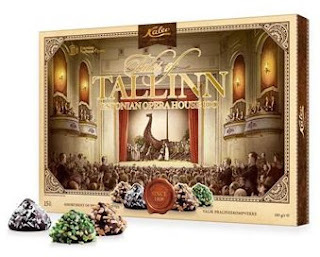 The Estonia Teater Assortment, the Milk Chocolate with Almonds, the Tallinn Cream Liqueur Chocolates and the Rum Flavored Wafer Chocolates all come highly recommended. Perfect for a hostess gift! Knitting traditional Baltic mittens and socks may seem a daunting project, but these DIY kits include everything you need to knit your own Estonian wool mittens and Latvian wool socks. Complete with instructions in English. 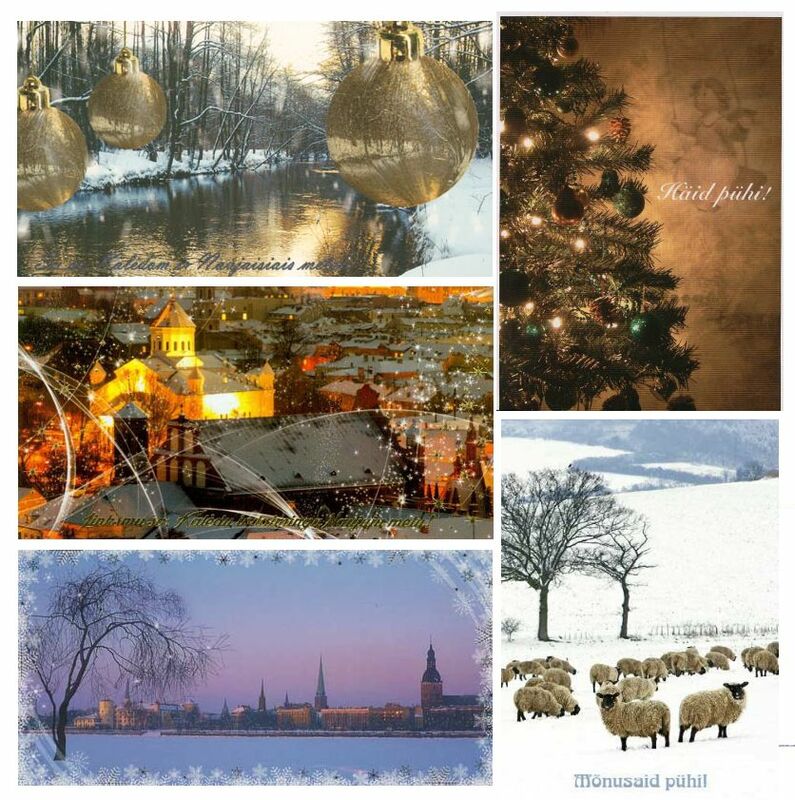 No matter if you wish to send your holiday greetings in Estonian, Latvian or Lithuanian, BalticShop has a wide variety of Christmas cards in an assortment of tastes. In addition to jewelry and amber products, BalticShop has a wide selection of books (in English, Estonian, Latvian and Lithuanian), music and ceramics – something for everyone on your holiday list that could use a little Baltic flavor this Christmas! 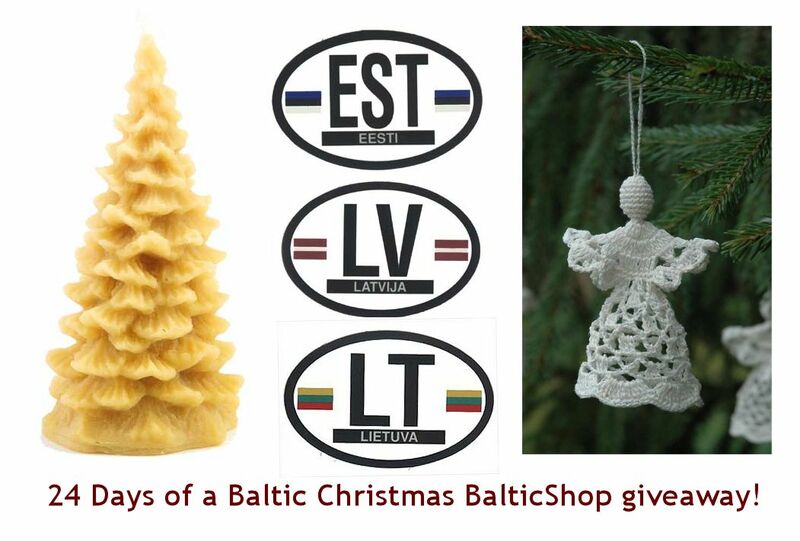 A lucky reader will receive one of the following gifts (your choice) from BalticShop: an EST, LV or LT Eurostyle bumper sticker, a crocheted angel Christmas tree ornament or a beeswax Christmas tree candle, AND $5 BalticShop bucks for their next purchase at BalticShop. To enter please visit the BalticShop website and then comment on this post with your favorite item. Entries will be accepted up until noon EST December 6, 2015 and the winner will be announced on the 24 Days of a Baltic Christmas on December 7th - at this point the winner will be contacted for choice and shipping information. 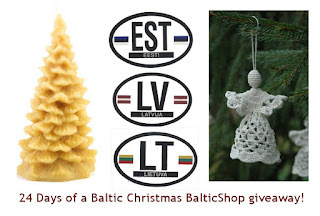 Thank you to BalticShop for sponsoring this giveaway, and may you find each and every person on your gift list a bit of Baltic cheer! I am enjoying your Baltic Christmas blog. Would like to comment on LOCALLY available products--- In both Tampa and Jacksonville, Florida nicely packaged Laima chocolates in boxes and bags from Latvia have been appearing on the specialty foods section shelves of TJ Maxx stores- dark chocolates w soft center fillings flavored as Tiramisu, Key Lime Pie, Creme Brulee. Also spotted at Jacksonville's Home Depot and Fresh Market: imported .Latvian birch logs with wicks for bonfires. Thanks Dagmar! For more local tips, stay tuned for Saturday's post... Hint, there are sources for piparkūkas and pīrāgi! Loving the Latvian bow tie. Might have to chip in and get it for the boss. Loving the amber ornaments! Another Baltic Christmas - Day 20, auseklis!